Back in high school, I used to eagerly look forward to my monthly delivery of Brio, the magazine for Christian teenage girls. Inside I would read articles about cool girls going on mission trips, trendy but modest fashion tips, and an advice column where girls would ask questions such as whether it was God's will for them to marry the youngest Hanson brother. 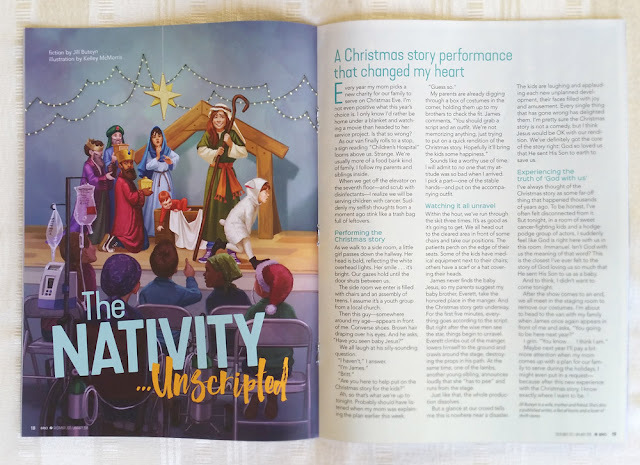 A few months ago I was commissioned to do an illustration for the December 2017 issue of Brio. 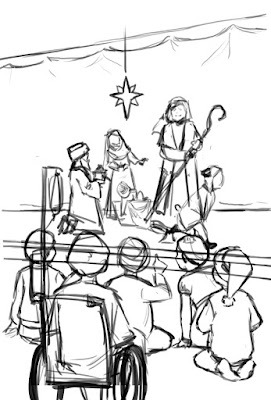 As soon as I read the art brief I knew that it would be fun to draw: a church group's last-minute attempt to do a nativity skit that turns into a fiasco. 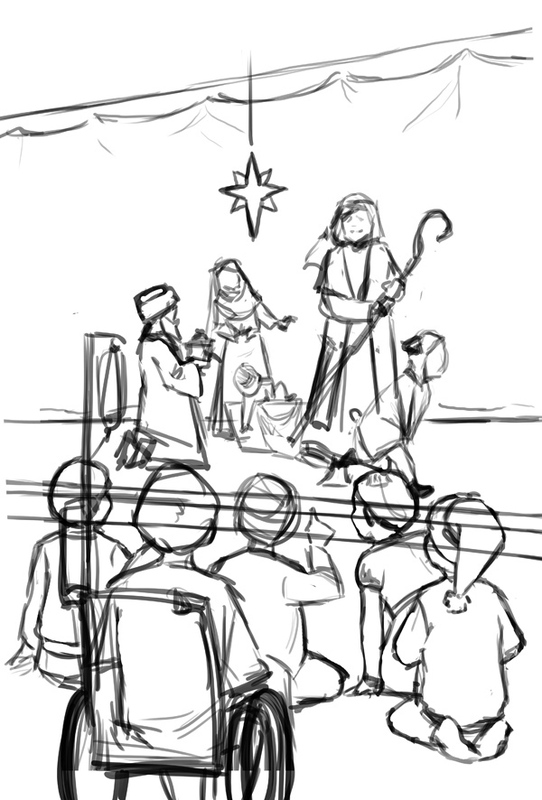 It's been a while since I've attempted to draw a humorous scene. 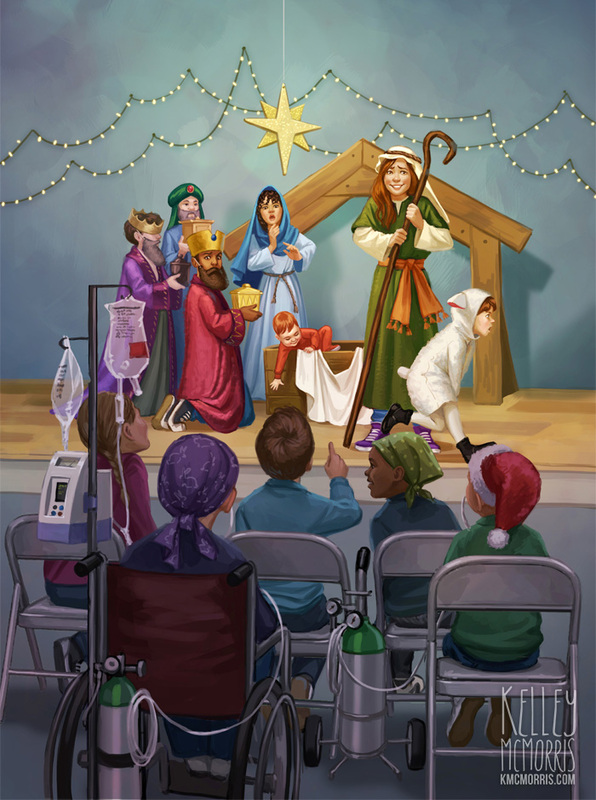 The story takes place at a children's hospital, so there had to be "sick-looking" kids in the foreground. 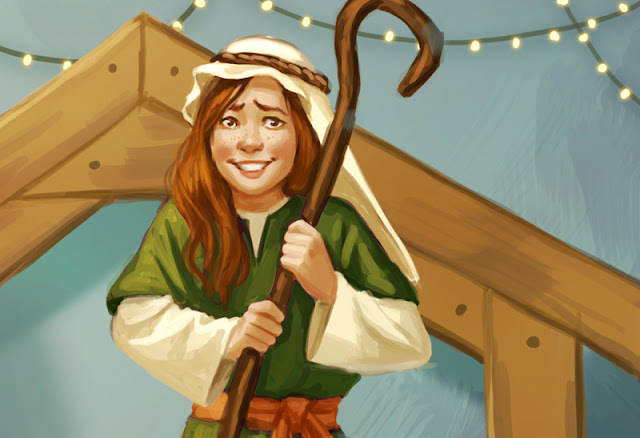 The art director also pulled some specific details from the story, such as the lamb running off to the restroom, and Baby Jesus escaping from the manger. I started with a very rough thumbnail. 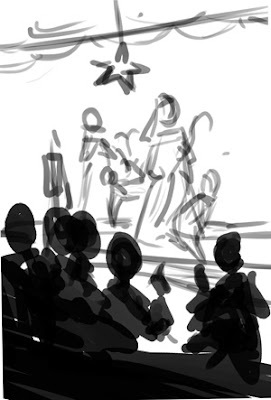 Then, piece by piece, I started sketching each person in the scene. For me, this is the hardest part of building an illustration. It's like taking a big rock of marble and starting to sculpt the first few chunks out of it. Then I went over the sketch again, cleaning up the lines and adding color. This took a very long time. I sent this sketch to the client. From there I was clear to go to final. This is the fun part. 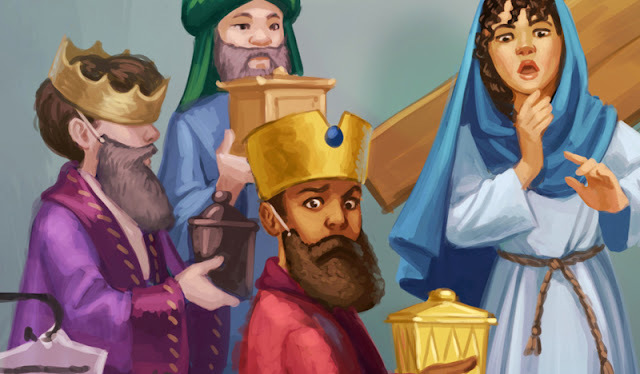 In the past I've drawn so many (so many) people wearing Biblical clothing, but this was a chance to make the costumes look a little cheesy and ill-fitting. 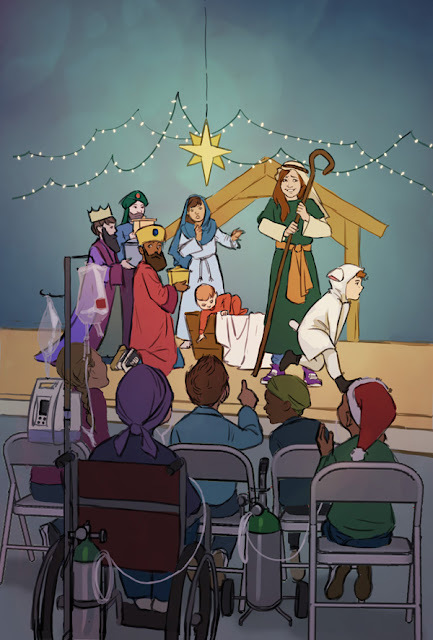 Looking back on this, I wish I had gone a little further with the cheesiness, but I was under a bit of a deadline crunch and there was a LOT to draw in this scene! The art director kindly sent me some copies of the issue in the mail! 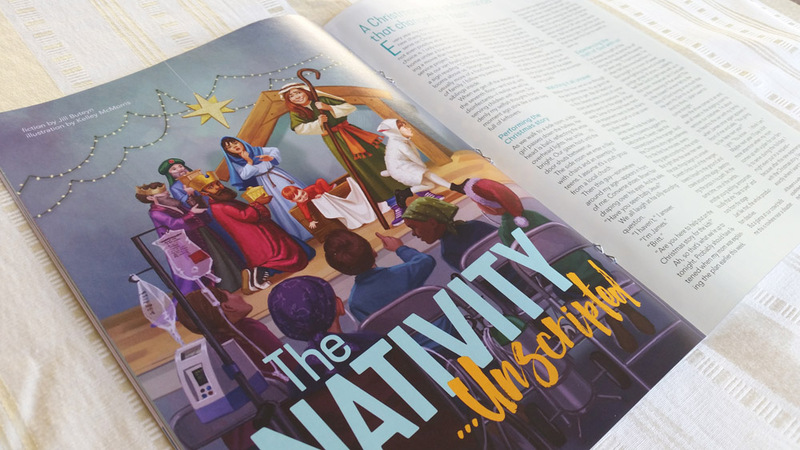 It's always so exciting to see my work in print! Thanks to Jenny Dillon for the assignment! So it's a general rule of blogging that you're not supposed to apologize for not blogging more often, but I'M SORRY FOR NOT BLOGGING MORE OFTEN. This year has been challenging in a lot of ways, and client work obviously takes precedence over the blog. But I do miss blogging, and I miss sharing motivational and informational posts rather than just talking about my own work. I hope that in the next few weeks, as I get a break over the holidays, I'll have a chance to set aside some time for writing. As always, thanks for reading the blog and leaving nice comments! 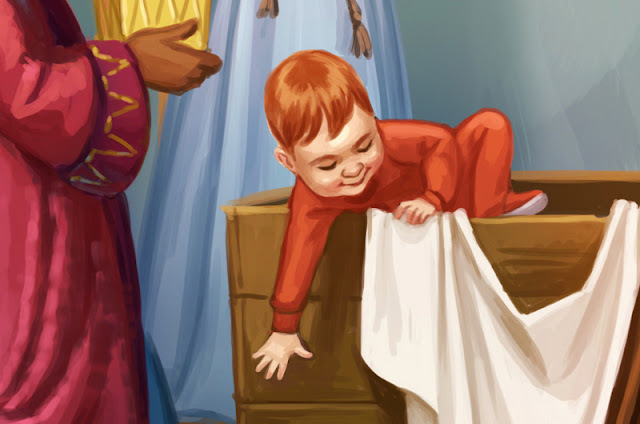 I get so happy when I come to check, and I see you have a new post! 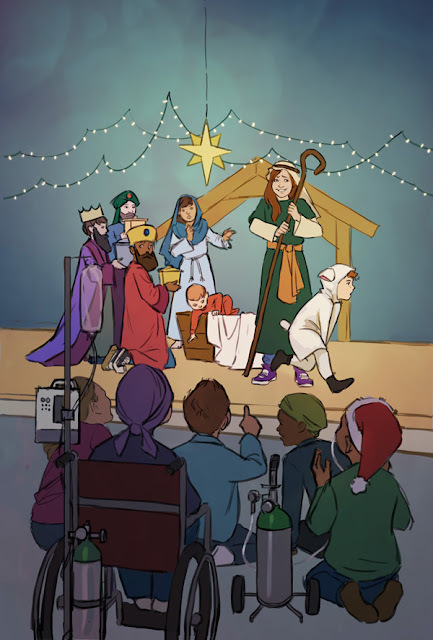 This is such a cute illustration, and that must feel so amazing to see your work in print. Merry Christmas, Kelley! Thanks Kalea! Merry Christmas to you too!